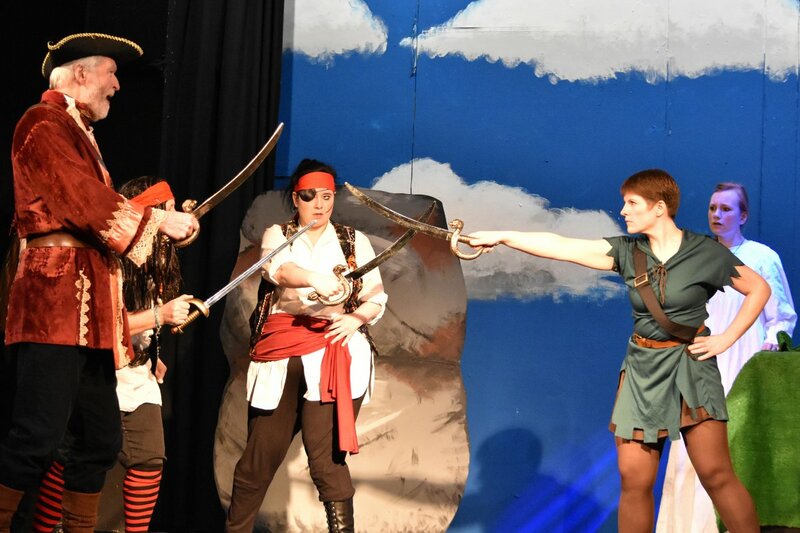 Burley Theatre Group celebrated the start of their 21st season with a re-telling of J M Barrie’s classic children’s story, Peter Pan, in Pantomime style. A script by Celia Fox, faithfully following the original book, was vibrantly brought to life by a large cast under Director, Pam Leach and Musical Director, Tony Clegg. There are two good indications of a good evening’s entertainment – firstly, that the audience are enjoying themselves and joining in with everything that is going on and secondly, that the cast are having fun. Burley certainly delivered on both of those. Amanda Clegg gave a strong performance in the title role of Peter Pan, bringing a totally appropriate exuberant child-like performance to the role, with a strong singing voice. His nemesis, the evil Captain Hook, played by John Wise, had the audience with him from the start, booing his every entrance. Was this really the same person who charmed us as Mr Darling? 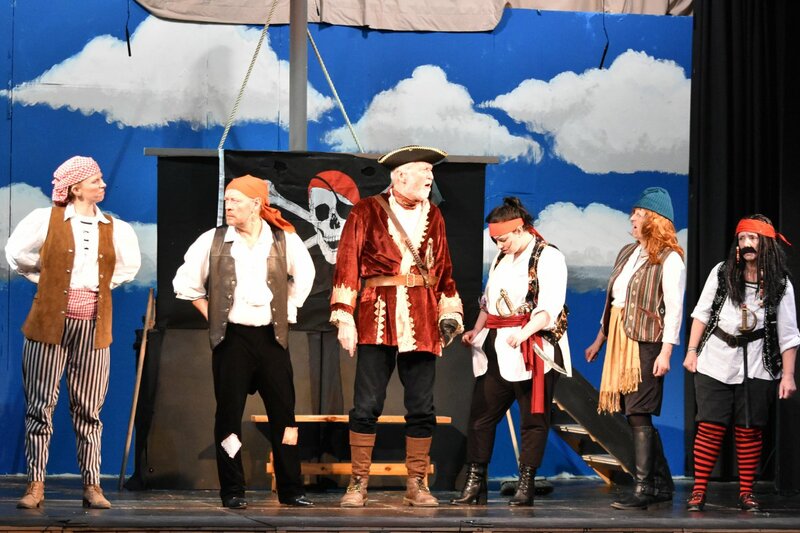 He was ably supported by a motley collection of pirates whose villainy was rather more comic than evil – well done Kathy Jackman (who also played Mrs Darling), Rachel Squire, Lesley Hoyle and Ann Bradley. But as in all good pantomimes, good conquered evil. Lauren Varley was a delightful Wendy, with a beautiful singing voice. 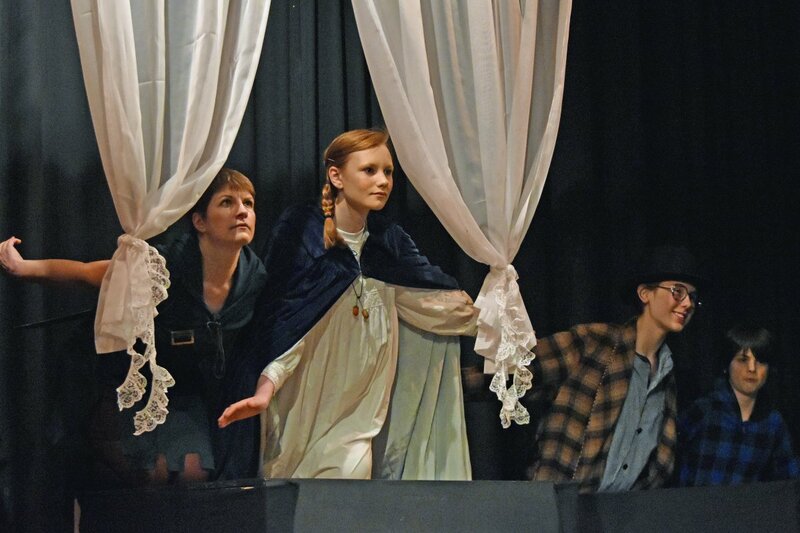 It was easy to see why she is an award winning Principal Girl and she will have a great future in amateur theatre. Wendy’s two brothers, Michael and John, played by Zachary White and Leah Turner, gave confident performances and supported Wendy in their adventures. Comedy was in the very capable hands of Tony Clegg, as Smee, the kindly pirate with such musical talent. Whether it was rocking with electric guitar or performing acoustic sea shanties, Tony was at ease with those and any other musical genre. Tiger Lily was delightfully played by Charlotte Dear – another young lady with a beautiful singing voice and a bright future – it was hard to believe she is only 13 years old. Big Chief Fox, Tiger Lily’s father, played by John Wright delivered just the right amount of comic gravitas to the part. Finally, how could I ignore the Lost Boys, at this performance played by Madeleine Kealey, Poppy White and Eva Harrington – so cute and confident. Music is an integral part of any pantomime and this show was no exception BUT there were some brilliantly unique touches that made this show stand out from every other pantomime I’ve seen this season – to start with, there was no sign of Baby Shark! But we were treated to songs from Bryan Ferry, Katy Perry, Ralph McTell, Creedance Clearwater Revival and many more. And if that wasn’t enough, we were entertained by an ensemble of musicians playing a variety of stringed instruments, rocking away to Let’s Stick Together. And even more – no taped pre-show music here but a trio of harpists (insert your own pantomime joke here). The harp also accompanied the moving light that was Tinkerbell. Congratulations also go to the unseen, hard working people off stage who support those on Stage – costume, makeup, sound, lighting, set builders & painters, prompt, stage manager, choreographers and everybody front of house. (Thank you for my raffle prize, by the way). They too deserve their round of applause. Sincere apologies, if I have missed anybody. Congratulations to everybody involved for a wonderful evening’s entertainment.